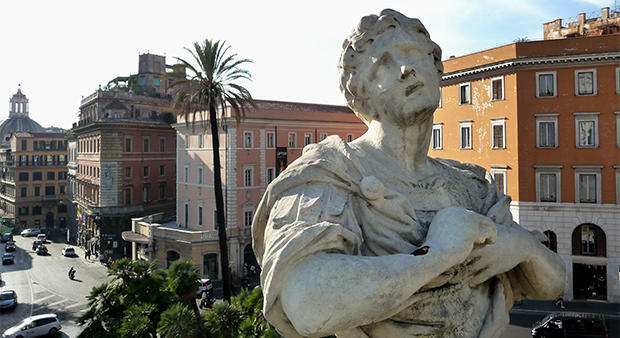 "Everyone knows Rome is stuffed with splendors—history, art treasures, architecture, plus great food and temperate weather. Less abundant in the Eternally Lively City are the kind of silent, green, secluded spots where sensitive souls can rest up between visits to the Coliseum, Forum, Vatican and the many other clamorous must-see sights likely to leave even hardy travelers with their ears ringing. But anyone who claims there are no quiet corners in Rome hasn’t followed the locals: how do they survive the sound of one another, not to mention 39 million annual visitors? Answer: Rome has plenty of unadvertised urban refuges. I’ve worn holes in my shoes looking for them. Two of my favorite historic gardens in the center of town are Villa Aldobrandini and the exquisite Botanic Garden." Author and private walking-tour guide David Downie's latest books are the critically acclaimed "Quiet Corners in Rome," "Food Wine Rome" and "Paris, Paris: Journey into the City of Light," soon to be an audiobook. His next adventure-memoir, published in April 2013, is "Paris to the Pyrenees: A Skeptic Pilgrim Walks the Way of Saint James." His websites are davidddownie.com, parisparistours.com, wanderingfrance.com/blog/paris and wanderingliguria.com, dedicated to the Italian Riviera.